Supernovae are essential to understanding the chemical evolution of the universe. 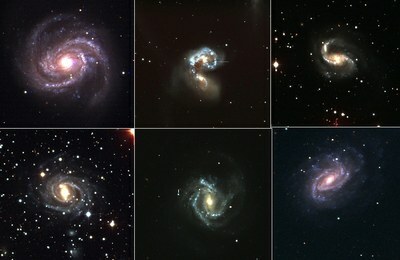 Type Ia supernovae also provide the most powerful observational tool currently available for studying the expansion history of the universe and the nature of dark energy. Our basic knowledge of supernovae comes from the study of their photometric and spectroscopic properties. However, the presently available data sets of optical and near-infrared light curves of supernovae are relatively small and/or heterogeneous, and employ photometric systems that are poorly characterized. Similarly, there are relatively few supernovae whose spectral evolution has been well sampled, both in wavelength and phase, with precise spectrophotometric observations. The low redshift portion of the Carnegie Supernovae Project (CSP) seeks to remedy this situation by providing photometry and spectrophotometry of a large sample of supernovae taken on telescope/filter/detector systems that are well understood and well characterized. During a five-year program, which began in September 2004, we expect to obtain high precision u'g'r'i'BVYJHK light curves and optical spectrophotometry for about 250 supernovae of all types with redshift range 0 < z < 0.1. The high-redshift CSP is aimed at providing an independent estimate of the dark energy contribution to the total energy content of the universe. Using Type Ia supernovae, the high-z CSP differs from other projects to date in its goal of providing an I-band restframe Hubble diagram. The CSP is focused on testing for and reducing systematic uncertainties by obtaining multi-wavelength observations of approximately 100 supernovae falling in the redshift range 0.2 < z < 0.7. This material is based upon work supported by the National Science Foundation under Grants AST-0306969, AST-0607438, and AST-1008343.